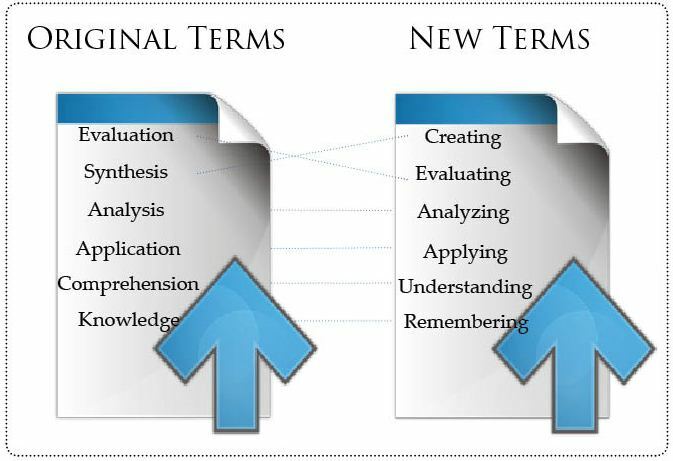 Bloom's Taxonomy is a classification of learning objectives within education proposed in 1956 by a committee of educators chaired by Benjamin Bloom who also edited the first volume of the standard text, Taxonomy of educational objectives: the classification of educational goals (1956). •The names of six major categories were changed from noun to verb forms. •As the taxonomy reflects different forms of thinking and thinking is an active process verbs were used rather than nouns. •The subcategories of the six major categories were also replaced by verbs and some subcategories were reorganized. •The knowledge category was renamed. Knowledge is an outcome or product of thinking not a form of thinking per se. Consequently, the word knowledge was inappropriate to describe a category of thinking and was replaced with the word remembering instead. •Comprehension and synthesis were retitled to understanding and creating respectively, in order to better reflect the nature of the thinking defined in each category.